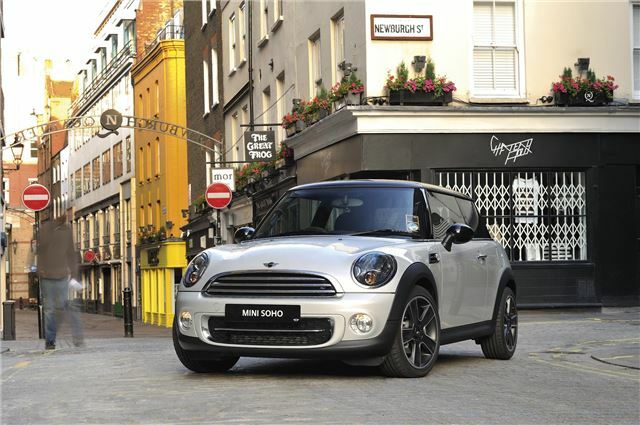 MINI has launched special Soho edition hatchbacks and cabriolets, priced from £16,765 on the road. The Soho is set to be one of several special editions named after famous areas of London. MINI Hatches and MINI Convertibles as both Cooper and Cooper D will be available with the Soho cosmetic treatment, which includes ‘White Silver’ paintwork, 17-inch ‘Black Star Bullet’ wheels, Bi-Xenon headlights with black reflectors on the outside and piano black finishing inside, as well as anthracite headlining and a three-spoke steering wheel. The Cooper Hatch and Convertible Soho editions are priced at £16,765 and £19,060, respectively, and the Cooper D Hatch, which is congestion charge exempt, costs £18,045. Finally, the MINI Cooper D Convertible Soho Edition costs £20,135. All four models are on on sale now and will be available until March 2011.